The Newington Butts amphitheatre was located in Southwark. Very little is known about this theatre, but it was believed to have been in use from 1580. It was, unfortunately, situated over a mile from the Thames, in Surrey, near an archery training field, and the Privy Council complained of "the tediousness of the way". At one time in England it was mandatory for all yeoman to become proficient in Archery. Archery Butts were therefore a common feature. With the introduction of the cannon and gun this particular requirement of Englishmen was abated freeing such land for other types of buildings. It is assumed that a theatrical entrepreneur of the age used this land to build the Newington Butts amphitheatre. Philip Henslowe, the close associate of Edward Alleyn, is known to have spent money on building work for this theatre. It is also known that the Admiral's men acting troupe played at Newington Butts in the late 1590's. 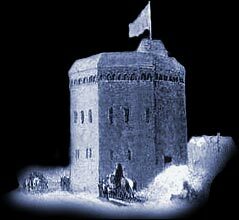 When a riot in Southwark broke out on June 23, 1592, the Privy Council closed Newington Butts and all of the other playhouses around London. The final demise of Theatre was described in 1637 when Theatre was said to have been "long gone". Theatrical entrepreneurs of the Elizabethan era, starting with James Burbage in 1576, wanted to by-pass the regulations placed by the City of London on the inn-yards. Burbage also wanted to create a real spectacle with their theatrical productions. In order to 'legitimise' the novel idea of permanent , purpose built theaters, a strong resemblance to the Greek theater and the Roman Amphitheater design was adopted. This linked the Elizabethan theater of the Renaissance period with the much admired classical theater and literature of the Greeks and Romans. The Elizabethan playwrights continued this theme by producing Tragedies and Comedies of a similar genre. William Shakespeare himself drew on the history of the ancients in Julius Caesar and Antony and Cleopatra. The massive popularity of the Roman Amphitheaters was about to be repeated hundreds of years later in Renaissance England (the first permanent Roman theatre was built in 54 AD).